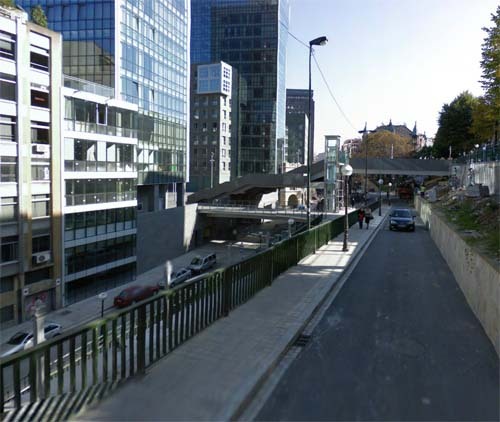 Uribitarte Kalea is a street in Bilbao, Spain. 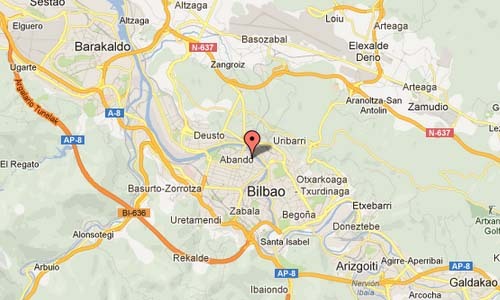 The area of Uribitarte adjoins the River Nervión and the left-hand extension of the city of Bilbao. It was once an island separated from the Abando plain by a branch of the river. After the definitive extension of the city at the end of the nineteenth century, Uribitarte ceased to be the island that it had once been geographically to become a continuous superficial extension that underwent a number of transformations over the years in keeping with the urban development of Bilbao. A river walk was formalised the entire length of the old docks development, from the left bank of the river right up to the built-up area between the La Naja district and the Guggenheim Museum. This promenade part of the project defined five clearly differentiated spaces: a docks space next to the river, a pedestrian tree-lined footpath half a metre above the docks area, a central green garden area over part of which the new tramline was to pass, a boulevard for ring-route traffic that, as a continuation of the street planned for the Andoibarra area, adopts the same character of a low-velocity thoroughfare, and a new five-metre-wide pavement going right up to the buildings in order to intensify the use of ground-floor premises that face on to the river. Work will also take into account connections with the footbridge that was constructed in recent years.